Navbar menu page made hidden? I am finishing up my site and would to have a specific page not visible in the menu. It is indirectly related to the site but would serve as other creative photos. It would be only accessible by clicking on a button on a specific page. I am curious if people click on it to reveal the photos. I think they are pretty creative but wonder if others feel that way and would comment but I do not want to detract from the main site’ focus. In my opinion if the client does not mind, plus the page to discover is not a major contribution to the overall of the website and it contributes as well to the positive feeling of using this website – why not. Nice touch I would say. Well, I have something similar. I am developing a website for a singer. I created an insignificant link button on an object somewhere on one of the website pages. If someone should really and (by me) unexpectedly click on it, then the visitor is directed to a page that does not appear in the navigation list. It is merely a surprise goody for fans to discover something about the singer and makes it a little bit interesting to give an insight. I would not do this for an ordinary business website. However, for an artist the websites should be artistic – at least a little bit. It’s all right with me (and the client’s management) if nobody discovers the button. The surprise goody page is only a very minor contribution to the website’s intention. There are few websites who do this actually quite on purpose with a lot of not obviously visible linked material. The user then has to click around and discover. A modal Bric, and you have a link in a word, or an icon, or a button to open that modal. A toggle Visibility , to a entire bloc, and you can show/hide with a word, icon, or a button. I don’t know if is this that you have in mind. I see, you would prefer a modal instead of a link to another page. Mmmh, very interesting thought. I will think about this. Is there any info as to whether users rather prefer a modal instead of being linked to another page on the website? Of course, at least in my case (cannot speak for etdronehome) this here is another use case, because normally this link is not visible (unless at mouse hover), but I myself feel annoyed when I am on a website and suddenly one of those modals come up and I have to close them. Maybe website visitors rather like modals? Just to clarify I want to make the page titled Idea Gallery invisible in the nav bar menu. I know that I can use a custom class nav bar… to adjust color etc of the menu fonts but i don’t know how make one page in the menu a different color. If i could change the color of just that page making it the same as the background color that would do it. I put it at the end for that reason. From the menu you can see the various client markets that I am targeting. to unique detail that they did. These images aren’t related to the different markets. So it really is a test. I would likely use a button, icon with a question or something to trigger the page redirection. I also know that I could make a custom menu but I was hoping to keep this effort as “minimally invasive” as possible. This will be my 2nd web site in 12 years. I had one for a business and modified it as needed. This is a new business (and last web site) and the learning curve was very steep with LR, PS and Blocs and flying etc. Hopefully I can get this live over the weekend with or without this last page. @Norm I think this is a really basic requirement to be able to hide a page from the navigation menu. In the real world, there are so many valid reasons for doing this. It would be most useful to have a default un-checked, check box in the nav Brics to hide the page from the nav menu when checked. Funny enough, yesterday, I had a request to add 4 hidden from navigation pages from a client to add calendar booking meetings for specific areas of the business which need to be hidden from general view. On the right bar or Layer Navigation, click in “List”, inside NavBar - > Nav Container . 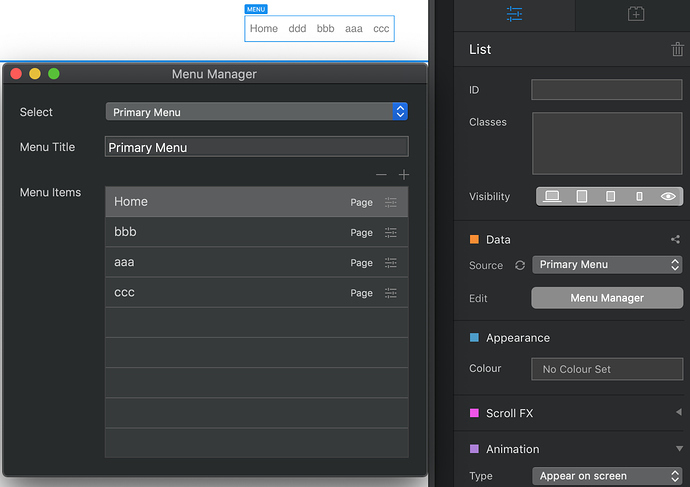 Then on the right bar or Inspector in Data, where you see Data -> Source, change it from “Primary menu” to “None”. Thats a long work around and far from ideal. There should be a way to just remove a page from the navigation at the page level. The requirement is not to make the page appear invisible, but to remove the page from the list of pages that can be navigated to, from the navigation used (usually nav bar). It still needs to be accessible and 100% usable by using a direct link to the page. So you can then click on the left side panel in the Nav Bar item and in the right side just tick the “Include Content Area” and in the space created just put anything that you want; a button, an icon a phrase, a new nav bar with only the list of pages, etc, etc and style it how you want. I was thinking that this functionality would be useful to offer clients the ability to view, approve, select and deliver photos and video clips. This would not be a substitute for a store front or drop box but a way for RE agents etc to view the photos on your site. RE agents are independent business’ and getting the images and their listing online quickly is crucial. I had given up on the hidden page issue when I turned my attention to dropdown menus. I got that to work but could not figure out how to link an element in the drop down list to a specific page that does not appear in the menu. Which took me back to the hidden page issue. I went to my “IDEA GALLERY” page and looked at the page settings and a checkbox is there that enables you to have this page appear in the main menu or NOT. I unchecked the page visibility option and “SHE GONE”! I could thus link the sub menu page element to this now “hidden page”. For client proof and approval of the photos I can now send a URL link directly to this page. I am shocked that nobody else knew about this simple “custom class less” solution or chose not to reply. Hello @etdronehome, just a question, that now that you found your solution. Explain me please what is the diference from the hide vs a normal page if you will have a link to that specific page? Or I miss completely what you really want to do!?! Can you please explain exactly what you need? As a general example. Let’s say you have five menu headings Home, About, Commercial, Editing and Contact. Each menu page link when clicked takes you to that specific page. These are your main focus pages. They fit neatly in one line on the menu. Now you want to add several additional pages and they are called Experience, Our Equipment and Our Team. If you add these they will appear in the main menu and as you add more pages the menu becomes cumbersome. Plus they play a supporting role but not the main focus. So if you uncheck view in the primary menu (page settings) on each of these three new pages, save the project and try to preview it. They will not be visible - they are hidden. Anybody looking at your site will only see the initial five headings: Home, About etc. They will not know they exist. You can get to them via the upper right corner menu dropdown. Now if you create a dropdown menu in the class manager and put Experience, Our Equipment and Our team in a new menu within the About page they will be visible (dropdown) when someone clicks on the About link. The three pages are now visible. That would be one example. In say case my site will have photos specific to Realtors, Property Mgr and Commercial. Each focus is different and has specific photos. These photos are examples of my work. The hidden page would only be accessible if they click on a button or text link. With the questions “Would you like to see more photos”? or something like that. When they click that button it takes them to my hidden page. The images on this page are creative but not related to the specific categories. I believe what you did, deleted the page completely from the menu. Attached are three screenshots that will show what I mean. The top and bottom one is the landscape hidden page.